The San Jose Rep has been having an exciting season and it’s not over yet! The stage production of The Kite Runner has its world premiere run now through April 19 and it is not to be missed. After reading the book a couple years ago I was very interested to hear about the stage production. Apparently SJSU Professor Matthew Spangler also loved the story; he adapted the novel to stage himself. “Its epic structure – spanning the continents and nearly 30 years – its powerful moments of high drama and its engaging characters make this an ideal story for live performance,” states Spangler. But this isn’t the only connection the novel has to San Jose. Novelist Khaled Hosseini moved to San Jose in 1980 when he and his family were granted political asylum from war torn Afghanistan. 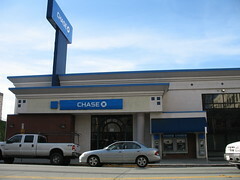 San Jose and the area around us also serve as a setting for part of the story. “No matter where you are born, what language you speak or what religion you practice, there are human experiences that bind us all, and The Kite Runner speaks to those experiences,” states Hosseini. The Kite Runner is a tale told through the lives of two boys growing up in Kabul in the same household, but in two starkly different worlds. Amir is the son of a wealthy businessman, while Hassan is the son of Amir’s father’s servant, a shunned ethnic minority. But fate, global politics and historical tragedy threaten both their lives and their friendship. If you have read the novel you know the story is not for young children, but the two violent scenes, integral to the storyline, are committed offstage. The chilling effect however is still strong. San Jose – Vote Woz! Woz left home to Dance with the Stars! See him tonight @ 8 PM – and give him your vote! Posted in Celebrity, Entertainment, TV | Comments Off on San Jose – Vote Woz! Earth Hour – Vote Tonight! Earth Hour begins at 8:30 tonight and ends at 9:30pm. To participate, all you have to do is turn out all the lights in your house at 8:30pm for one hour. You can still use your electricity, just no lights. EarthHour.org has been encouraging the world to send a message in this way since 2007. It started in Sydney when 2.2 million homes and businesses chose to spend an hour in darkness. In 2008 the message went worldwide, and 50 million people participated. Look outside your window during this time tonight and you will see lights out at the Golden Gate Bridge in San Francisco, the Colosseum in Rome, the Opera House in Sydney and the Coca Cola billboard in Times Square. This year the organization is asking us to Vote Earth. They consider it the world’s first global election, a choice between Earth and global warming. What will you choose? All you need to participate is a flip of a switch. Lights out for one hour and you are done. Don’t be surprised to see lights out at your neighbor’s house too – and if you don’t, perhaps you should walk over there right now and ask them send in their vote: Switch off for Earth. The website has a great deal of information and many other suggestions on how to participate including taking photos for the Earth Hour flickr group, uploading a video to YouTube, writing a live Blog Post and even updating Twitter. San Jose MetBlogs is participating; we hope you do too! I have seen many storefronts claiming to sell “vintage” clothes but upon entering the store you realize they are just overpriced thrift shops. So when my 17 year old daughter requested a trip to Moon Zooom on West San Carlos Street I was skeptical but willing to go. I looked at their website and they claim to carry items from the 1950s through the 80s, but still I was skeptical. The truth could not have been further from my expectations. Moon Zooom is awesome. They have racks and racks (and racks!) of well organized, well cared-for clothes, and different rooms assigned to different decades. There are a few newer costumey pieces, but overall this is true vintage material. I saw many dresses that I swear my mother owned when I was a child. My daughter tried on what seemed to be fifty different outfits, from 60s mini skirts to 70s muumuus to 80s aerobics gear, and she ended up purchasing two fabulous dresses for around $20 each and a 70s concert shirt for $15. The store employees were also very helpful and friendly. The clothes are all in fantastic condition, with only the shoes showing much wear. Speaking of shoes, if you need white go-go boots, this is the place to find some! I did not notice any children’s wear but there was a variety of adult sizes. The entire second floor is devoted to 80s clothing but honestly, I remember the 80s as being a lot prettier. We had the most fun downstairs rifling through racks and racks of adorable clothes from the 60s and 70s. As an added bonus, when you check out you receive a $3 coupon for a future purchase. Moon Zooom is located on 1630 West San Carlos Street in San Jose. There is parking on the street. Cash and credit cards accepted, no checks. Store hours: 11am to 7pm every day, call for holiday hours 408 287 5876. Violinist Ju-Young Baek, in her third appearance with Symphony Silicon Valley, performs Johannes Brahms’ Violin Concerto in D this Thursday, Saturday and Sunday at the California Theatre. Ms. Baek, a multi prize-winning violinist, has performed around the world. She has performed as soloist with orchestras including the London Philharmonic, the Finnish Radio Orchestra, the Oslo Symphony, the Tokyo Symphony, the Singapore Symphony Orchestra, the Korean Broadcasting System Orchestra, the Seoul Philharmonic Orchestra, the St. Petersburg Philharmonic, the Tblisi Philharmonic in the Georgia Republic, and the Alma-Ata Symphony in Kazhakstan. She has also performed in many festivals and recitals. George Cleve will conduct Symphony Silicon Valley; along with Brahms’ Violin Concerto, the Symphony will perform Hector Berlioz’s Le carnaval romain and Antonin Dvorak’s Symphony No. 9 – From The New World. Dandelion Vegetarian Cafe has been open on Santa Clara Street since October, serving up a few new options for vegetarian diners. The location has hosted several vegetarian places over the last few years, mostly with somewhat similar menus, based on what I think is a Vietnamese tradition. Dandelion focuses more on Chinese dishes, though there are options from around Asia. The wide-ranging menu is based on family recipes, from a family that’s touched bases in Vietnam, Malaysia, and Indonesia on the way from China to the USA (blown by the wind like dandelion seeds, they say). The noodle soups are the most recommended dishes, though rice plates are also available. One favorite is the spicy pickle noodle soup. It has salty green vegetable pickles and a soy-infused boiled egg (optional) in a tasty broth with rice noodles. I had the spicy pickle noodle soup on my first visit, months ago, and it’s the dish I’ll be most likely to go back for. Spring noodle soup, which I tried on my last visit, was also excellent, with mushrooms and a variety of beancurd shapes, and again a seasoned egg, flavorful broth, and rice noodles. The squid noodle soup that I had on an earlier visit, though, was not really my thing, reminding me of hot and sour soup you can get at most Chinese restaurants. The owners also suggest trying the desserts (though I haven’t checked them out). One favorite is a Chinese Pancake. Another is the Malaysian polut hitaum, which is sticky rice in coconut milk, and is one of the few desserts that can be made vegan. 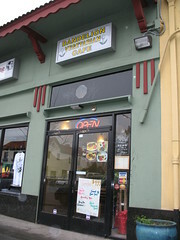 Dandelion Vegetarian Cafe is at 322 East Santa Clara Street, between 7th and 8th Streets. They’re open Monday-Friday from 10 am to 9 pm, and weekends from 1 pm to 9 pm.